MarksBlackPot: Dutch Oven Recipes and Cooking: Welcome! I admit, I need another blog like I need another hole in my head. But that never stopped me before, right? But I was inspired by my good friend over at "Confessions of a Mormon Foodie". I've enjoyed reading his thoughts on eating, and I've also enjoyed talking them over with him. So, I'm sharing my own experiences. Last Father's Day, my wife bought me a single 12" dutch oven. I'd always wanted to learn how to do it, so when she did that, I jumped right in. I got a few books, read up a little, and found some websites and started. I seasoned the oven, and one sunday afternoon, I made pizza. I'd had fond memories of having dutch oven pizza as a young boy scout, so I did it. And it turned out GREAT! I was hooked. I started a tradition of doing our sunday dinner in the back yard. Rain or shine, summer or winter. I've missed a few weeks where I've been sick, or out of town, and there've been some dishes that have been less than spectacular (like my first attempt at an apple pie - yeesh). But still, I've had some real hits. 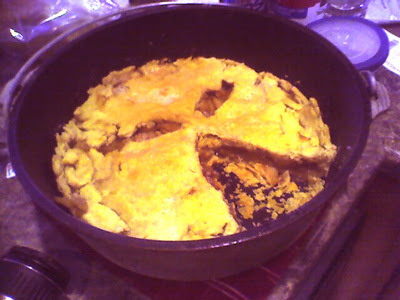 And, most recently, the successful apple pie. So, here's where I'll be posting my experiences with my black pots each week. Recipes, tweaks, successes, failures. Just for fun, and a cool place to archive all my work. We're in for a tasty ride! Hey Mark! Thanks for the plug, and the link, for "Mormon Foodie." I've added you to my blogroll, as well.